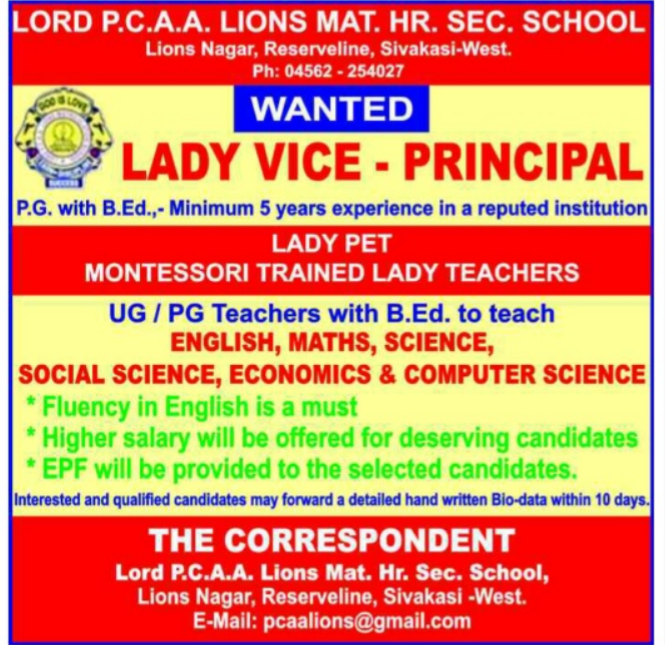 LORD P.C.A.A Lions Mat.Hr.Sec.School, Sivakasi west has advertised in DINAMALAR newspaper for recruitment of Vice Principal, PGT, TGT jobs vacancies. Interested and eligible job aspirants are requested to apply within 10 days. Check out further more details below. Name of the School: LORD P.C.A.A Lions Mat.Hr.Sec.School, Sivakasi west. About School: LORD P.C.A.A Lions Mat.Hr.Sec.School, is one of the school located at virudhunagar also a famous school. 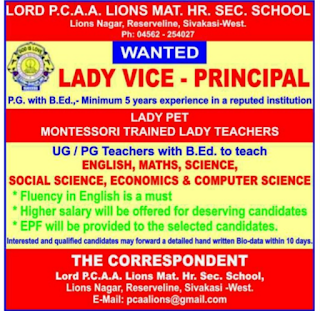 (a) Lady Vice Principal: PG with B.Ed minimum 5 years experience in a reputed institution. Higher salary will be offered for deserving candidates. EPF will be provided to the selected Candidates. How to Apply: Interested and eligible candidates may forward a detailed hand written Bio-data with in 10 days.